Home › Blog › Human hair extensions....Does country of origin matter? In the early days virgin/remy hair companies were few and far between compared to today. Now we have so much choice in terms of vendors, buying hair can be a daunting task, especially if you’re not a seasoned weave wearer. The hair extensions industry, just like any other is constantly changing. If you’re not privy to hair extensions in general its easy to get lost in the fast pace of it all. A prime example of how fast the industry can move can be seen with the ‘country of origin’ trend. When 'Brazilian' hair extensions first came along, it was the best hair you could get at the time. If you were still rocking 'premium now' during that period, you weren't rated. It felt like the popularity of 'packet hair' dropped overnight, and hair bundles were the main thing everyone was buying. Then after Brazilian came Peruvian (apparently better than the one before), then Malaysian (two times better than the one before), then Indian (three times better than the one before...you get my drift), then there was European, Russian, Filipino, Armenian and the list still goes on. But truth be told, even with all this choice the majority of hair extensions still come from India and China. Therefore the hair origin isn't really important (unless you're buying the raw stuff) as its an ever changing variable. What is important is how the hair is collected and processed. Below i've put together a breakdown of hair extension types in relation to the process it goes through and the way its collected and put together. I've split them up into five main categories raw, remy, non remy, virgin and synthetic. RAW - This hair is usually cut from the base of the scalp and bundled and often comes from one donor. The hair is combed, has short hairs removed, wefted and then washed. Its the most unprocessed hair you can get. 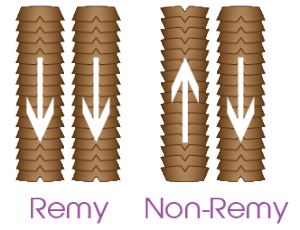 REMY - Is considered to be the best type of human hair you can get without breaking the bank. Cuticles are intact and aligned in the same direction which means the hair is less prone to tangle and matt, increasing the longevity of the hair. NON - REMY - Is still human hair but is essentially hair left over from different places, salons, temples etc. Cuticles are usually stripped but if they're left intact they're wefted in different directions which means the hair is prone to tangle and matt. Outer part of the hair shaft that protects the hair and helps lock in moisture. VIRGIN - A term used to refer to human hair that hasn't been chemically process eg. dyed, permed, coloured or bleached. If the hair does have a uniform wave or curl, its usually created using the steam method as opposed to using chemicals. Also the way the hair is sourced from the donor may vary. SYNTHETIC - Hair made from non-human materials. * Are they all going in the same direction.